Looking for a place to relax? A place for your next family or friends gathering? A starting point for outdoor activities? 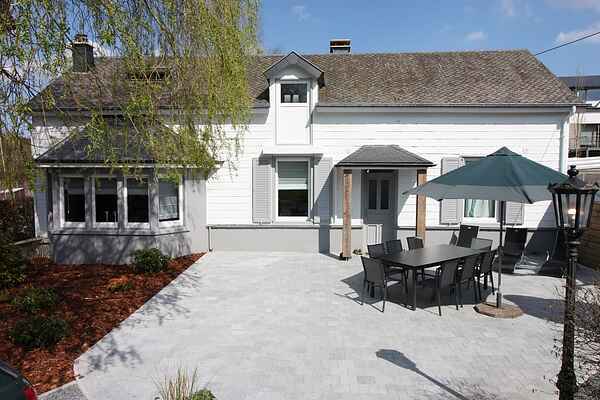 This house in the heart of the Pays de Bouillon is the ideal place... The house will open in April 2017. Under a bright sun and while the kids play in the fenced garden, peacefully enjoy a drink on the terrace. Between walks and discoveries by bike the days will be intense... Do not miss the barbecue. On a cold autumn or winter day, what is greater than sitting by the fireplace? The Semois valley retains its character and originality. Hollows of rivers in spectacular horizons, an exceptional meeting of nature with history. You can enjoy these gifts of nature by bike, mountain bike or on foot. To enrich your stay we recommend, among other things, a visit to the atelier - tobacco museum (230 m), to the Bouillon castle (7 km), to the animal agri-museum and park Rochehaut (10 km), to the slate mine in Alle (13 km), to the farm of fairies in Les Hayons (19 km) and to the Orval abbey (40 km). To discover! Rent bed linen and towels, the beds can be ready for your check-in. The property is secure for children, parking spaces, shelter for bikes or motorcycles.